and 25 Teen Choice Awards in Six Seasons! BURBANK, CA (June 2, 2015) – Mystic Falls bids farewell to one of TV's hottest vampires when The Vampire Diaries: The Complete Sixth Season, is released on Blu-ray™ and DVD on September 1, 2015, from Warner Bros. Home Entertainment. Season Six is also available to purchase on Digital HD. Averaging nearly 2.7 million viewers weekly in its sixth season, The Vampire Diaries remains The CW’s #1 show with young female demos and will return for a seventh season on The CW this fall. Fans can get sucked into all 22 one-hour episodes from season six and gorge on nearly two hours of gripping extras — including two brand-new featurettes, episodic audio commentary, the 2014 Comic-Con panel, deleted scenes and a gag reel. 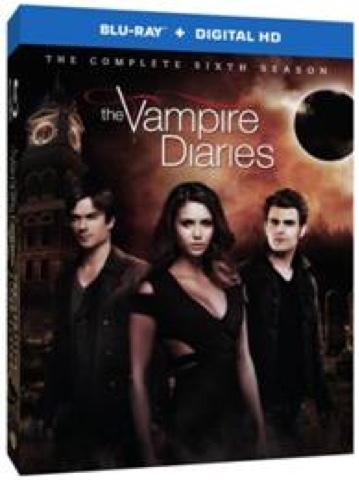 The Vampire Diaries: The Complete Sixth Seasonwill be priced to own on DVD at $49.99 SRP and on Blu-ray at $54.97 SRP. With Blu-ray’s unsurpassed picture and sound, The Vampire Diaries: The Complete Sixth Season Blu-ray release will include 1080p Full HD Video with DTS-HD Master Audio for English 5.1. The 4-disc Blu-ray will feature a Hi-definition Blu-ray, and a Digital HD copy of all 22 episodes from Season Six. Season six of The Vampire Diaries stars Nina Dobrev (The Perks of Being a Wallflower, DeGrassi: The Next Generation), Paul Wesley (Fallen, Everwood), Ian Somerhalder (Lost), Steven R. McQueen (Everwood), Kat Graham (17 Again, Honey 2), Candice Accola (Dating Rules from My Future Self, Supernatural), Zach Roerig (Friday Night Lights), Michael Trevino (Cane), Matt Davis (Damages, Blue Crush) and Michael Malarkey (Raw). Based on the series of books by L.J. Smith, The Vampire Diaries is from Bonanza Productions Inc., in association with Outerbanks Entertainment, Alloy Entertainment, Warner Bros. Television and CBS Television Studios. The executive producers are Kevin Williamson (The Following, Scream, Dawson's Creek), Julie Plec (The Originals, Kyle XY), Leslie Morgenstein (Pretty Little Liars, Gossip Girl, The Originals) and Caroline Dries (Melrose Place, Smallville). The series was developed by Williamson and Plec. The show has received numerous awards, winning a People’s Choice award for Favorite New TV Drama in its first season. The series has also won 25 Teen Choice awards thus far. · The executive producers and cast of The Vampire Diaries say a final farewell to Nina Dobrev, Steven R. McQueen, Marguerite MacIntyre, and Michael Trevino, after six memorable years. Fan reactions to big moments throughout the season will be curated from Twitter, fan sites and other social media, and pieced together to tell the story of season six via fans’ reactions. 7. Do You Remember The First Time?